Superman Through the Ages! is a website dedicated to the preservation of the Superman Legend and Mythos. KAL-L serves two purposes: Firstly, it is a forum for discussion about Superman, his legend, his comic books, and anything else that its members feel like talking about. Secondly, it contains timely announcements of changes and updates to Superman Through the Ages! 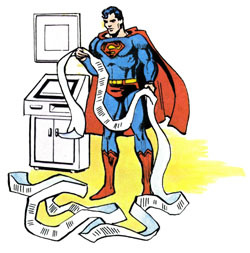 The KAL-L mailing list is no longer active or supported and has been superceded by the Superman Through the Ages! forum. Action 775, Superboy, The Great Superman Book, Return to Krypton and current comics, Best Luthor Stories, Krypton, Supergirl DVD, and more! Kryptonian Alphabet, Superman DVD, Smallville, Superman Stamps, Krypto, "It's a Bird, It's a Plane"
Infestation, Doom Patrol, Swan Diving, Bewitched, Superman 170, DVD, Smallville, The Movie, Miracle Monday, Zod, Supergirl, and A LOT MORE!